GSMT Control Workshop Tucson, September 11-12, 2001 Pointing Control for a giant segmented mirror telescope Patrick Wallace Rutherford Appleton Laboratory. 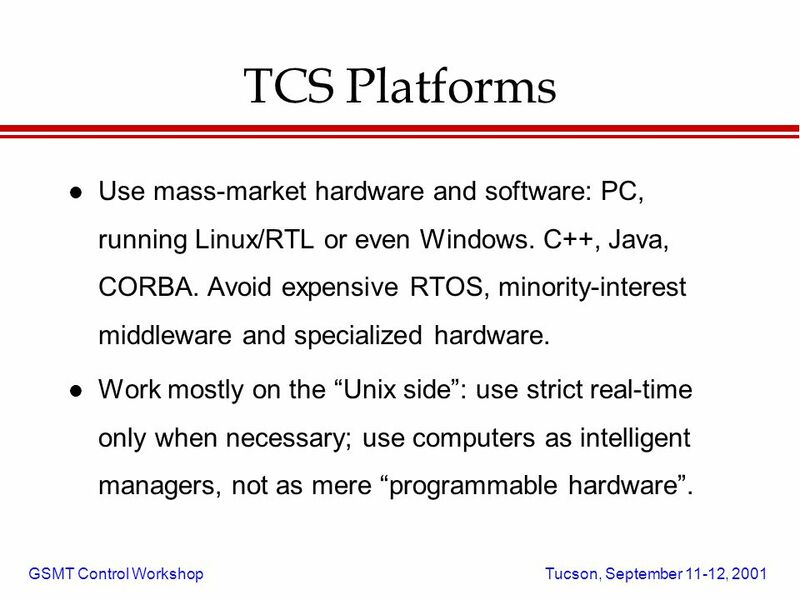 3 GSMT Control Workshop Tucson, September 11-12, 2001 TCS Platforms l Use mass-market hardware and software: PC, running Linux/RTL or even Windows. C++, Java, CORBA. Avoid expensive RTOS, minority-interest middleware and specialized hardware. l Work mostly on the “Unix side”: use strict real-time only when necessary; use computers as intelligent managers, not as mere “programmable hardware”. 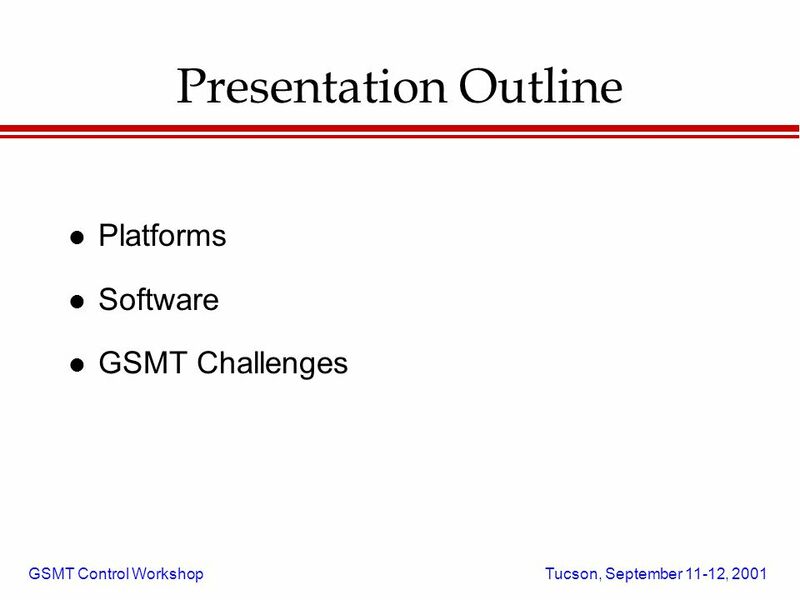 4 GSMT Control Workshop Tucson, September 11-12, 2001 TCS Design Philosophy l The science requirements, plus observing scenarios, merely sample the required functionality. 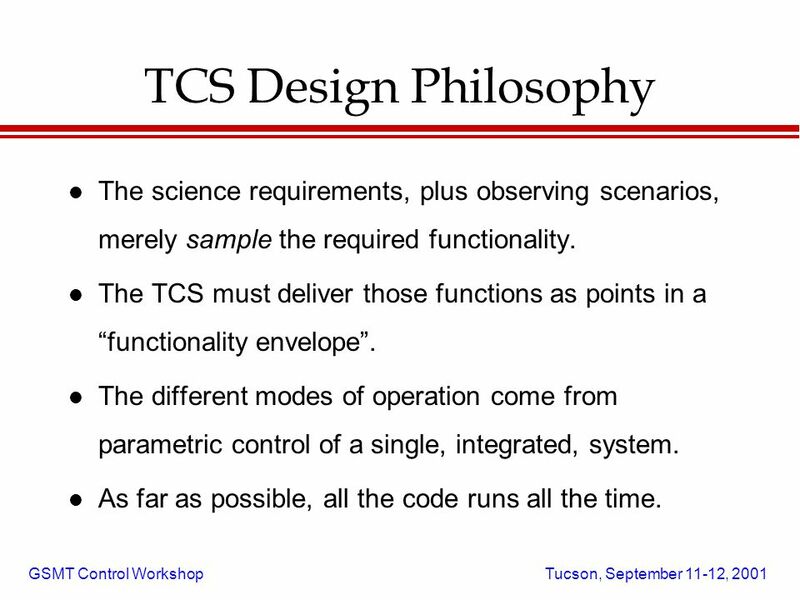 l The TCS must deliver those functions as points in a “functionality envelope”. l The different modes of operation come from parametric control of a single, integrated, system. l As far as possible, all the code runs all the time. 5 GSMT Control Workshop Tucson, September 11-12, 2001 Specifying the Pointing l Not simply where the optical axis is aimed. 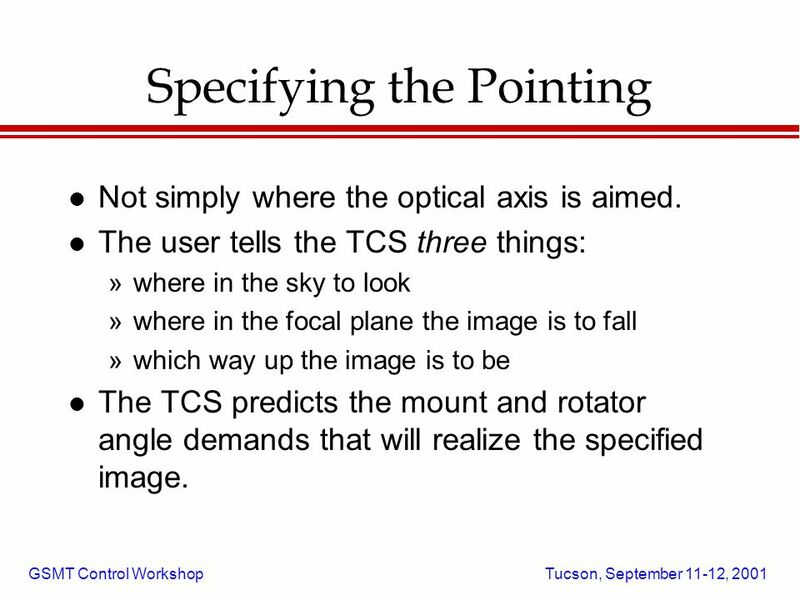 l The user tells the TCS three things: »where in the sky to look »where in the focal plane the image is to fall »which way up the image is to be l The TCS predicts the mount and rotator angle demands that will realize the specified image. 6 GSMT Control Workshop Tucson, September 11-12, 2001 The Pointing Flow l Starts with target position. 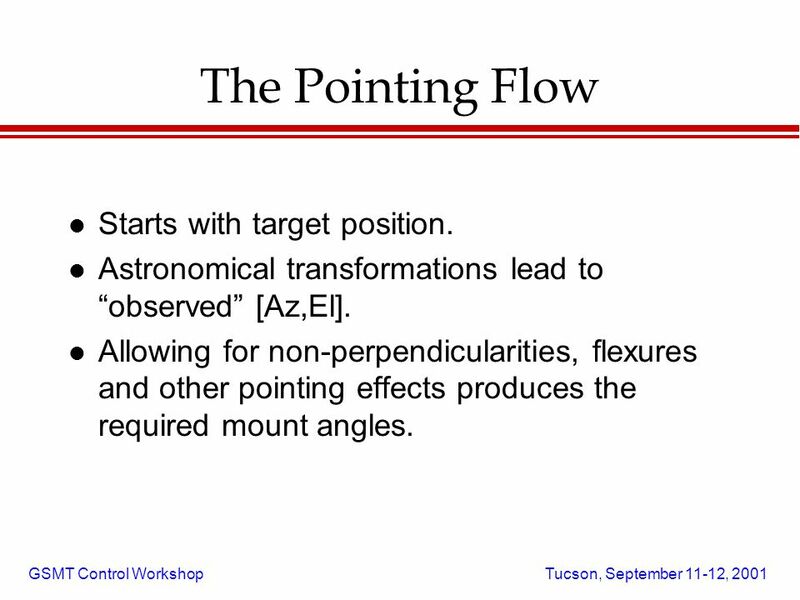 l Astronomical transformations lead to “observed” [Az,El]. l Allowing for non-perpendicularities, flexures and other pointing effects produces the required mount angles. 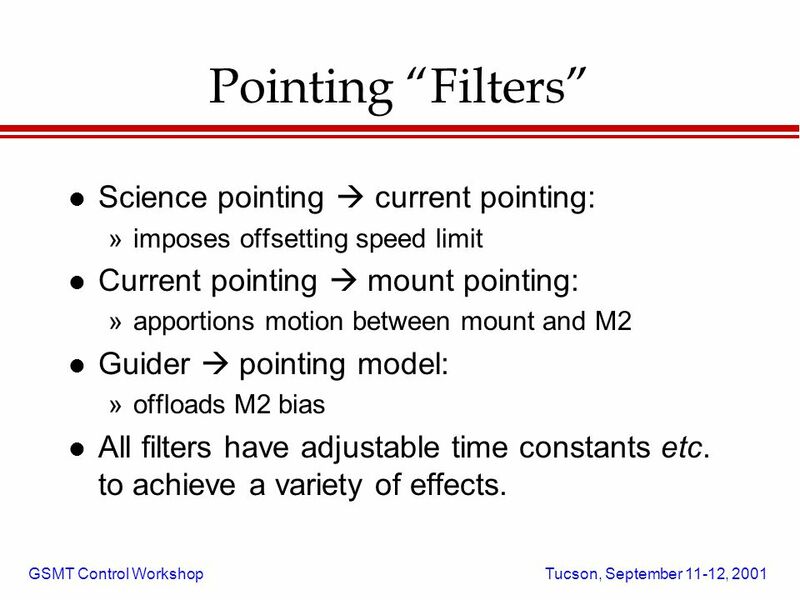 7 GSMT Control Workshop Tucson, September 11-12, 2001 Pointing “Filters” l Science pointing  current pointing: »imposes offsetting speed limit l Current pointing  mount pointing: »apportions motion between mount and M2 l Guider  pointing model: »offloads M2 bias l All filters have adjustable time constants etc. to achieve a variety of effects. 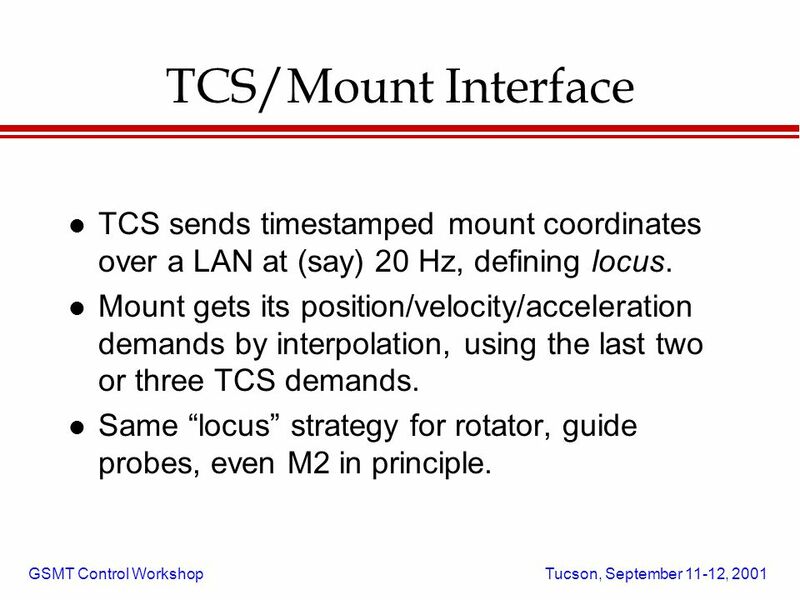 8 GSMT Control Workshop Tucson, September 11-12, 2001 TCS/Mount Interface l TCS sends timestamped mount coordinates over a LAN at (say) 20 Hz, defining locus. l Mount gets its position/velocity/acceleration demands by interpolation, using the last two or three TCS demands. l Same “locus” strategy for rotator, guide probes, even M2 in principle. 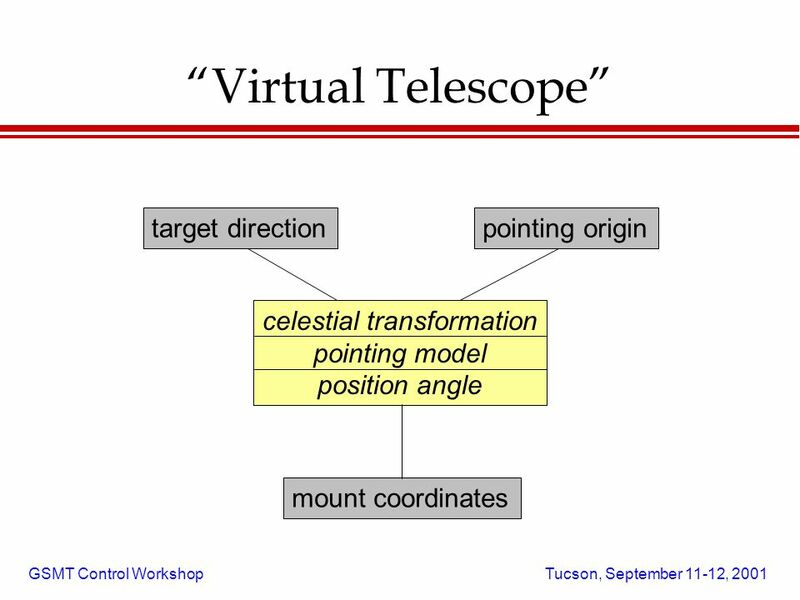 10 GSMT Control Workshop Tucson, September 11-12, 2001 Guiding l Each guider is a separate “virtual telescope”. 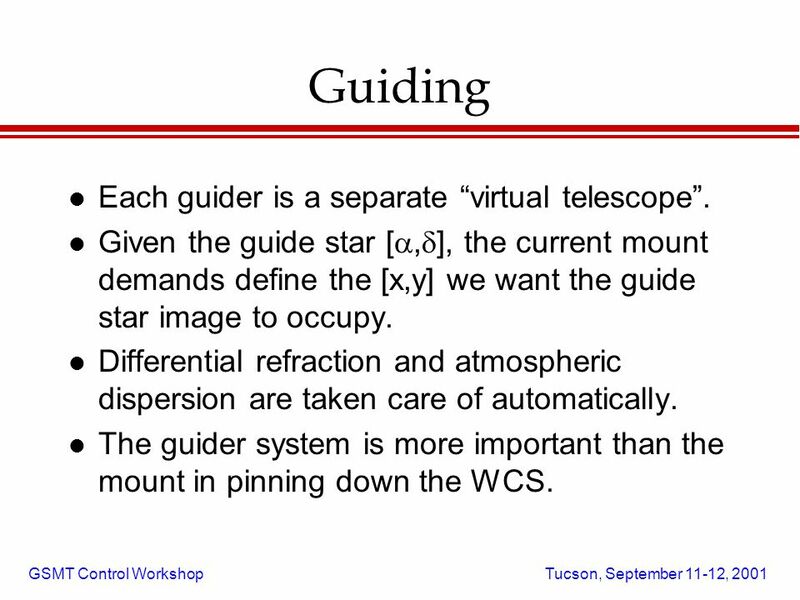 l Given the guide star [ ,  ], the current mount demands define the [x,y] we want the guide star image to occupy. l Differential refraction and atmospheric dispersion are taken care of automatically. l The guider system is more important than the mount in pinning down the WCS. 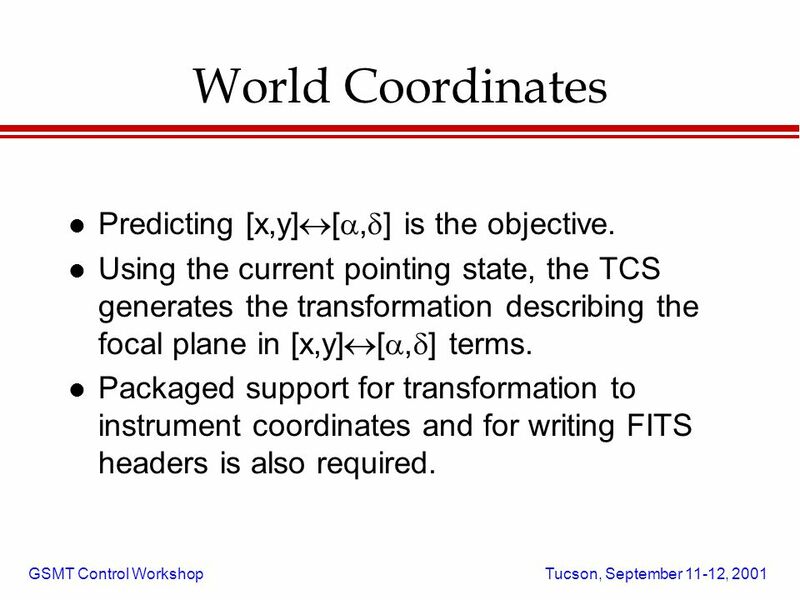 11 GSMT Control Workshop Tucson, September 11-12, 2001 World Coordinates l Predicting [x,y]  [ ,  ] is the objective. l Using the current pointing state, the TCS generates the transformation describing the focal plane in [x,y]  [ ,  ] terms. l Packaged support for transformation to instrument coordinates and for writing FITS headers is also required. 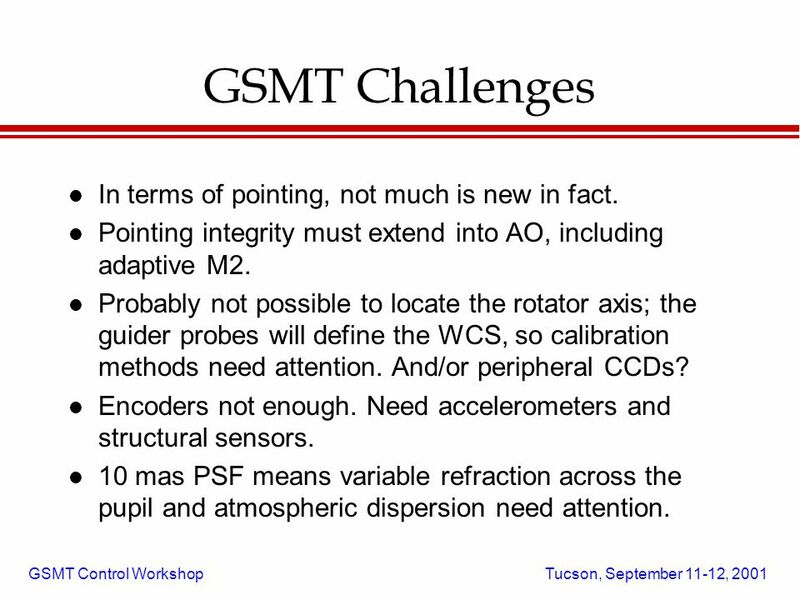 12 GSMT Control Workshop Tucson, September 11-12, 2001 GSMT Challenges l In terms of pointing, not much is new in fact. l Pointing integrity must extend into AO, including adaptive M2. l Probably not possible to locate the rotator axis; the guider probes will define the WCS, so calibration methods need attention. And/or peripheral CCDs? l Encoders not enough. Need accelerometers and structural sensors. l 10 mas PSF means variable refraction across the pupil and atmospheric dispersion need attention. 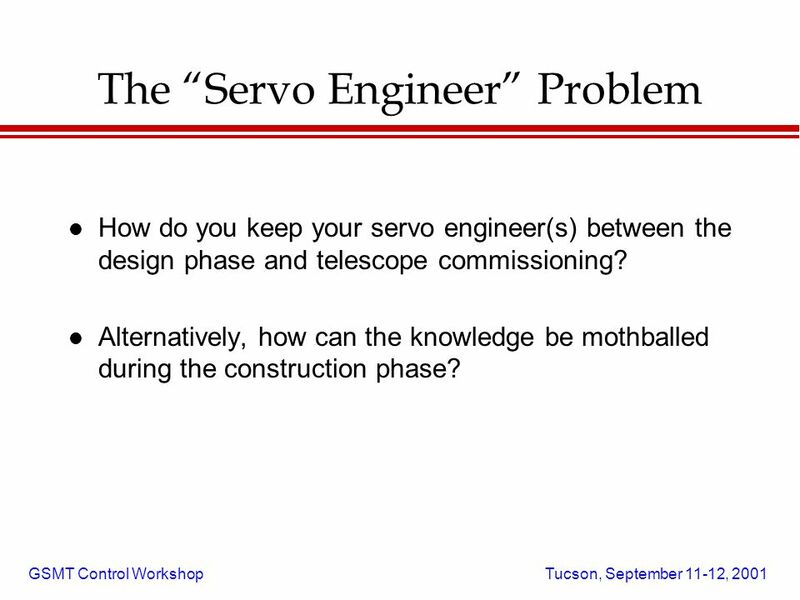 13 GSMT Control Workshop Tucson, September 11-12, 2001 The “Servo Engineer” Problem l How do you keep your servo engineer(s) between the design phase and telescope commissioning? l Alternatively, how can the knowledge be mothballed during the construction phase? 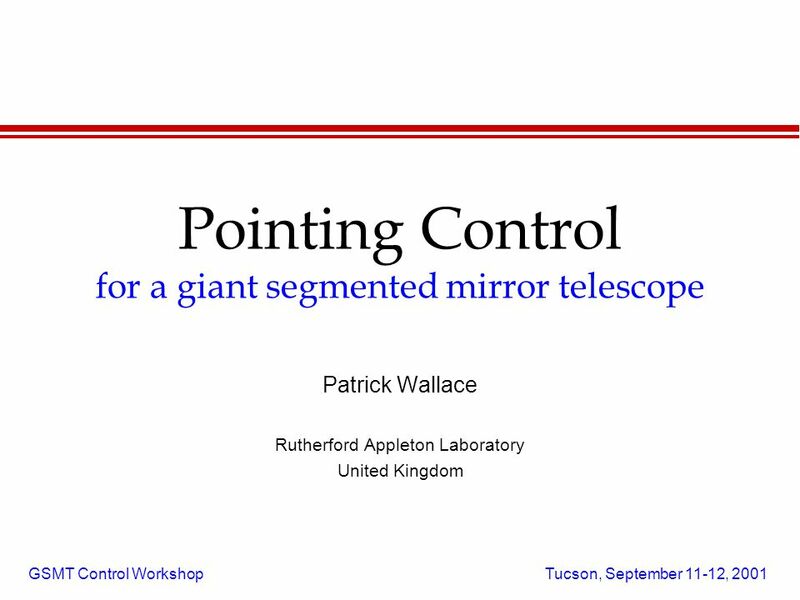 Download ppt "GSMT Control Workshop Tucson, September 11-12, 2001 Pointing Control for a giant segmented mirror telescope Patrick Wallace Rutherford Appleton Laboratory." What is HiCIAO ? Near-infrared high contrast imaging instrument with a linear polarimetor at the 8.2m Subaru telescope. Targets: exoplanets and proto-planetary. Günter Weitersberger SNiFF+Cross Advanced. © 2000 Wind River Systems, Inc. What is SNiFF+Cross ? Use your PC to develop UNIX applications Unified software. Adaptive Optics1 John O’Byrne School of Physics University of Sydney. Deriving the true mass of an unresolved BD companion by AO aided astrometry Eva Meyer MPIA, Heidelberg Supervisor: Martin Kürster New Technologies for. 1 Astronomical Observational Techniques and Instrumentation RIT Course Number Professor Don Figer Telescopes. TCS Software Design Review. Have we understood all the requirements? Do we understand all the quirks of the hardware? Is the design capable of doing the. George Angeli 11 September, 2001 Current Concepts and Status of GSMT Control Systems. Chapitre 3- Astrometry PHY6795O – Chapitres Choisis en Astrophysique Naines Brunes et Exoplanètes. LBT AGW units Design Review Mar.2001 General Concept Performance specifications and goals The off-axis unit The mechanical support structure The control. Motion Tracking. Image Processing and Computer Vision: 82 Introduction Finding how objects have moved in an image sequence Movement in space Movement. Understand the football simulation source code. Understand the football simulation source code. Learn all the technical specifications of the system components. NGAO Instrumentation Overview September 2008 Updated Sean Adkins. Reegan Worobec & David Sloan In collaboration with UAARG.  Background  Problem Statement  Solution  Mechanical › Azimuth › Elevation › Concepts › Static and Dynamics of System  Software › SatPC32 › Interpolation. The Gemini MCAO System (EPICS Meeting, SLAC, April 2005) 1 The Gemini MCAO System Andy Foster Observatory Sciences Ltd.